Describe an unloading valve using the 5 main characteristics used to classify pressure control valves. Describe the basic operation of an unloading valve. 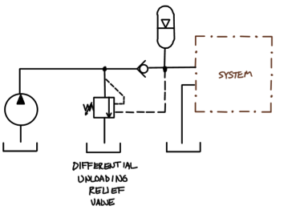 Describe operation of this high-low pumping circuit making use of an unloading valve. Assume pump A is high flow/low pressure and pump B is low flow/high pressure. 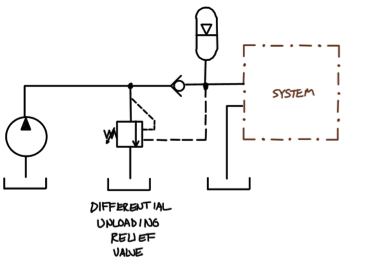 Assume set value of unloading valve is half that of the main pressure relief valve. 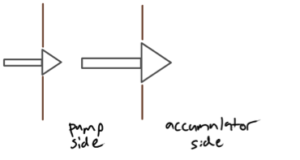 Identify the purpose of the check valve between pump A and B. When pressure in the external pilot line reaches the set value of the unloading valve identify the magnitude of the pressure differential across the unloading valve when it opens. 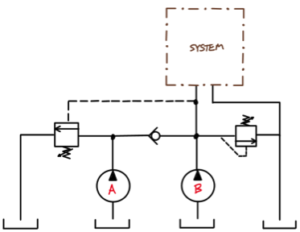 Identify 2 general applications of a high-low pumping circuit. Compare and contrast regenerative extension with high-low pumping circuits making use of an unloading valve. Describe operation of this hydraulic circuit making use of an unloading valve and an accumulator. Identify problems with this circuit when the unloading valve is pilot operated. Use this hydraulic circuit and diagram of two pilot darts to describe the general operation of a differential unloading relief valve. Describe the operation of this hydraulic circuit making use of a differential unloading relief valve and an accumulator. 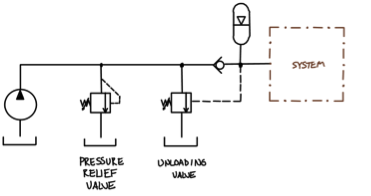 Describe how this hydraulic circuit making use of a pressure switch replicates the function of an unloading valve. Describe how this hydraulic circuit making use of a pressure switch that turns off the prime mover when pressure is in excess of the set value contributes towards efficient operation.